In order to enter the heavenly realms, say numerous ancient spiritual traditions, we must be dressed appropriately…lightly, that is, in a sacred robe of radiant splendor. Attaining this robe is our life’s purpose. 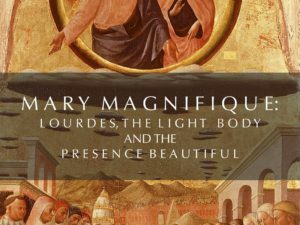 For serious seekers of the glorious mysteries of this garment of eternal light London’s British Museum offers numerous pieces that will inspire your journey and move your soul closer to its goal of blending with the divine. On a recent visit I had an opportunity to catalog a few of them. Follow me on this journey to the ‘garment of the gods’. The place to begin is, of course, the museum’s Mesoptamian section. This is where we come face to face with a hauntingly powerful image of a Sumerian divine being. 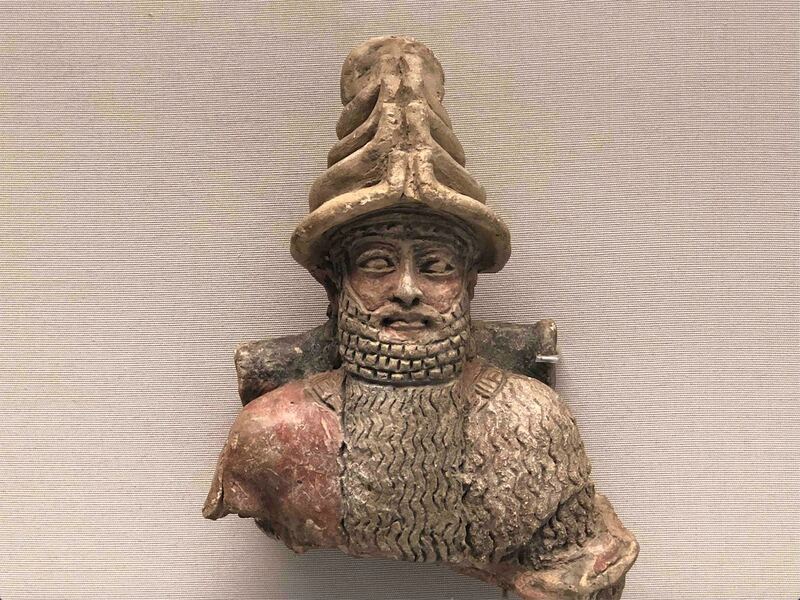 This may be An or Anu, the King of Heaven, as another name for the horned head dress he is wearing, “the royal cap of Anu”, tells us of his divinity. So, too, does the garment draped over his shoulder. Composed of wavy lines, and covering his body, it is called the Melammu, a Sumerian word that means “divine radiance”. Wearing this robe gave the gods a supernatural awe-inspiring sheen, a glow of whiteness, light, and spiritual force. It is the distinguishing attribute of the gods; one that separates us and them. Yes, the Melammu gave the gods super powers, making them “giants” or “mighty ones”. However, the Anunnaki taught that this garment is transmittable. A human can become divine by acquiring the melammu from a divine being. Weaving the melammu or shining Robe of Light, mostly by collecting images and stories about it, has been my ‘work’ for nearly two decades. The Sumerian originals are the source for biblical and other references to the luminosity of beings from angels to saints, Alexander to Buddha. 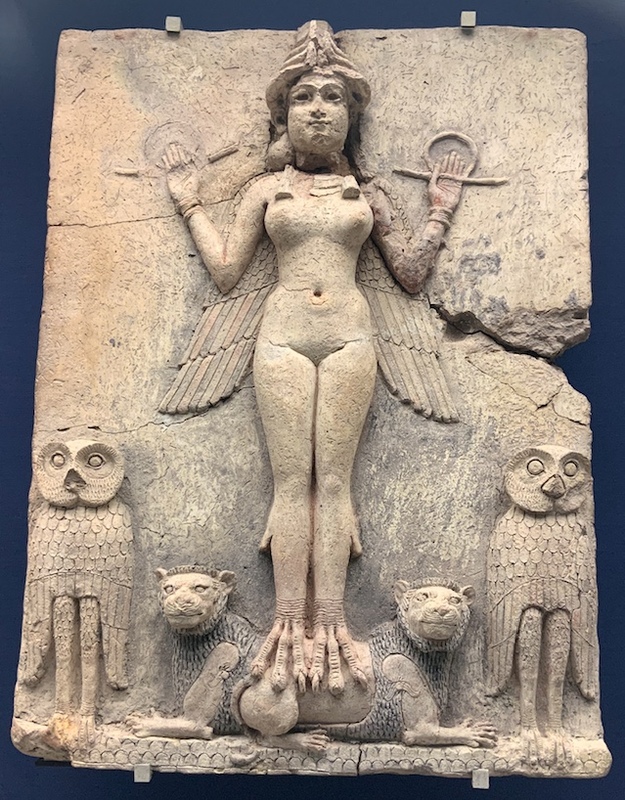 I seek to come face to face with works of art such as this because, as the Sumerians believed, they are imbued with the “presence” of these beings. One can actually feel it when standing before these works. 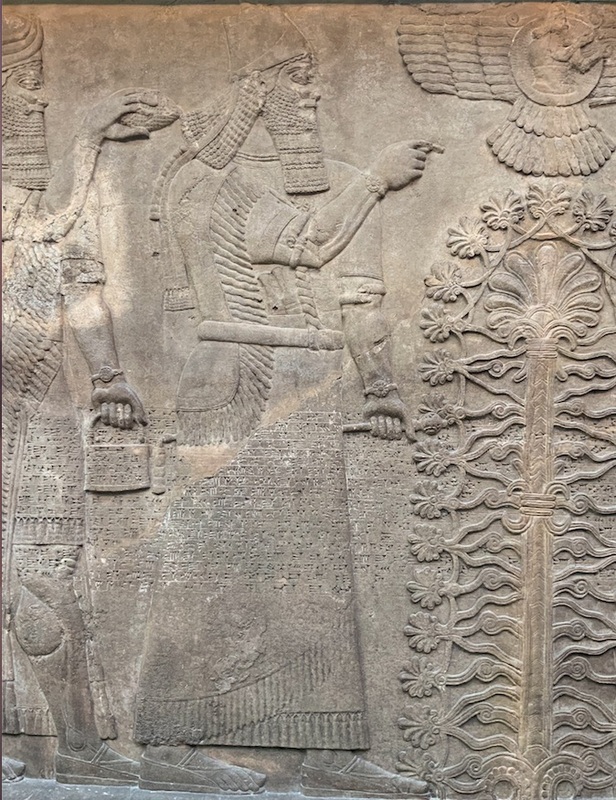 Inanna wears the royal cap of Anu. The philosophy of ‘ensouled’ or living art is the driver behind the British Museum’s famous Sun God Tablet (c. 860 B.C. ), which commemorates the king, Nabu-apla-iddina’s, successful installation of a new gold and lapis statue of the Sun god, Shamash. 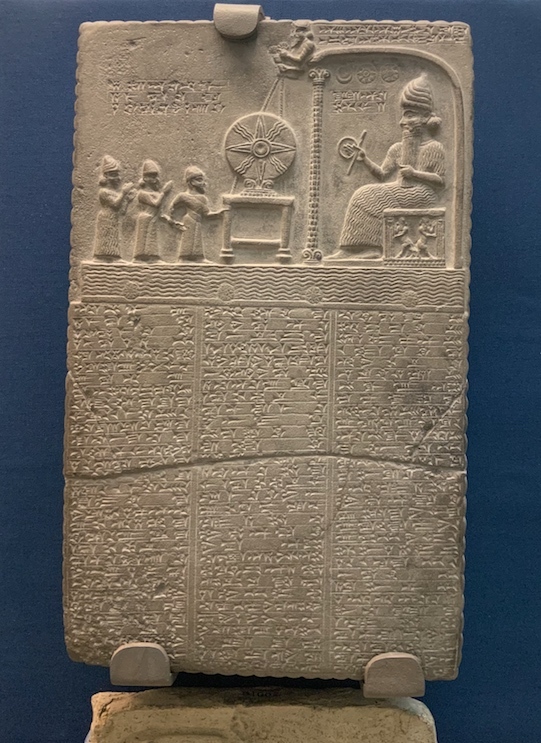 The box that housed the tablet is labelled seven times “Image of Shamash’. 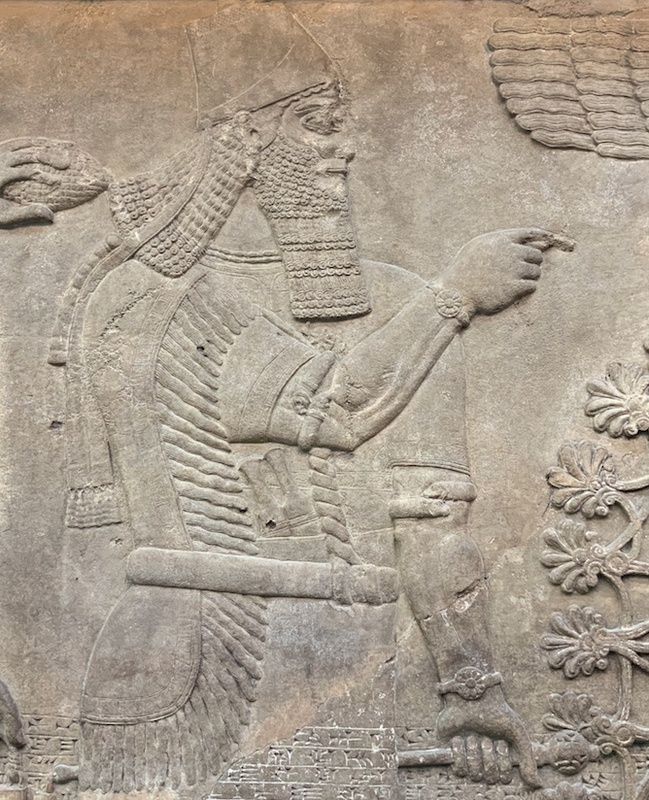 In the Sumerian mind, the Image of Shamash IS Shamash. The god need not come to earth in flesh and blood. His image transmits his presence. Our attention is drawn to Nabu, who sits on his throne, holds a rod and ring, wears the horned royal cap of Anu and sports a full length representation of the Melammu. 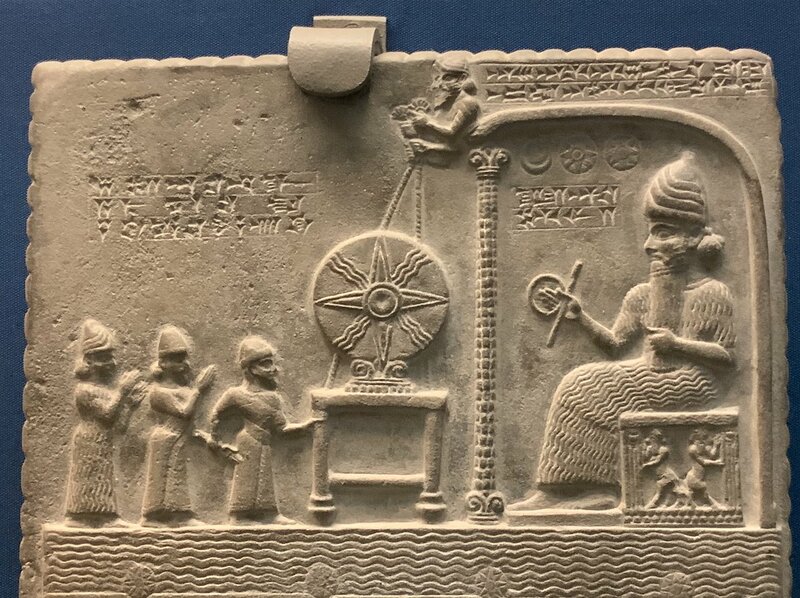 If we are thinking like a Sumerian, we may read this scene to say that Nabu has received the divine radiance that clothes his body from the image of the divine Shamash. 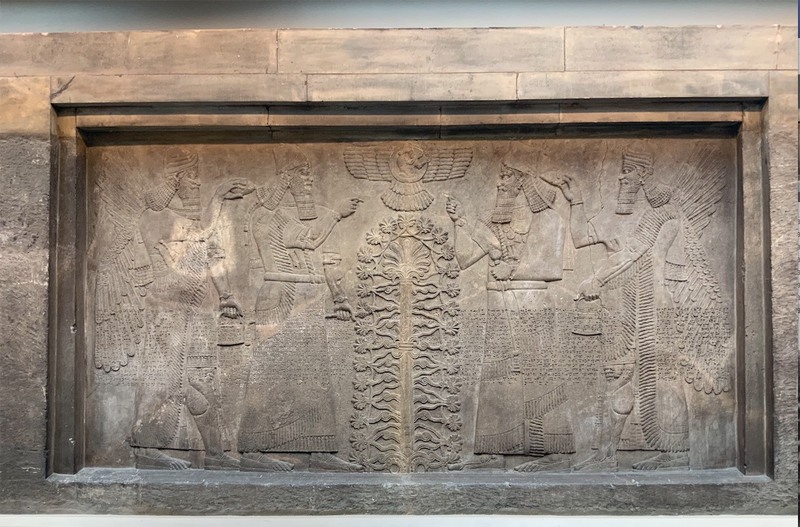 Shamash appears in the form of a man in a winged disk in the Assyrian scene below, also from about 865-860 B.C., King Ashurnasirpal is dressed in a ritual robe that clearly resonates with the Melammu and holds the mace symbolizing authority. He stands before the radiant Sacred Tree, and makes a gesture to Shamash in the winged disk above. 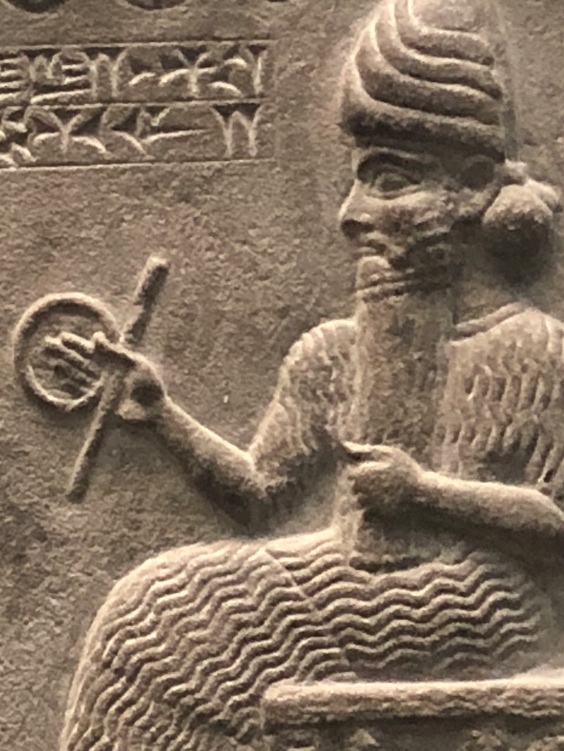 Shamash holds the ring of divine or cosmic sovereignty, a Mesopotamian symbol of god-given kingship. 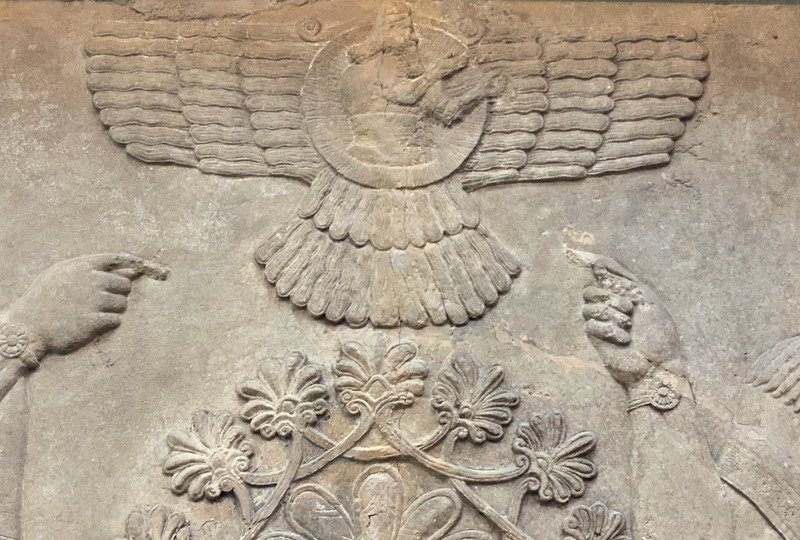 Shamash in the winged disk. This scene was placed behind the royal throne of Ashurnasirpal. However, they were also embroidered on royal clothes, affirming my reading that this scene is actually about the transfer of the robe or its mystical powers to the king. A further clue that this is an ascension scene is the ‘handbags’ held by the supernatural beings. These ‘bags’ contain the Heavenly Book or Tablets of Destiny, the keys to the king’s ascension to the celestial realm. Detail of Ashurnasirpal’s feathered robe. In this detail of the king’s robe we see that it is feathered and fringed. It is feathered because it is his ‘ascension robe’ and fringed because its radiance surrounds, encloses or ecnompasses his body. It matches the robe of the supernatural being wearing the horned ascension cap who is assisting him. Again, I read this as a celebration scene capturing the moment the divine beings wearing the feathered, fringly cloak transmit the radiance of the robe to the king. 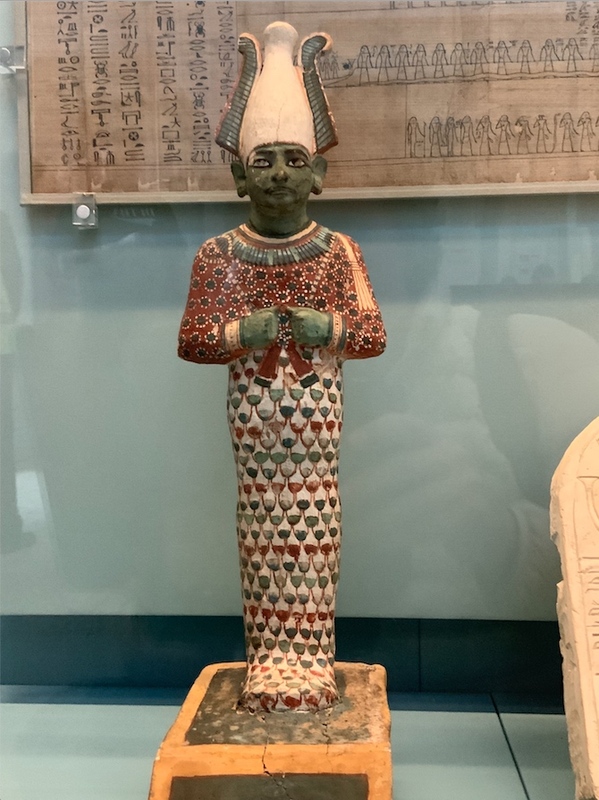 Speaking of feathers, moving to the museum’s Egyptian section we find numerous light body images (too many to discuss here), including this brilliant statue of a feathered Osiris. Osiris in his cloak of many colors. 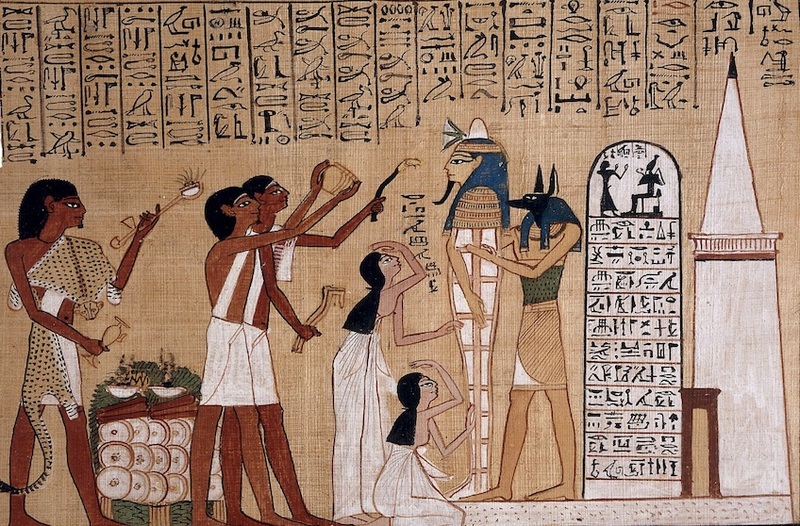 The British Museum has some wonderful examples of the Egyptian Book of the Dead, which were derived from the oldest religious texts in the world, Egypt’s Pyramid Texts. These tell of the transmutation of the pharaoh into a flash of lightning. The ‘Book’, used for over 1500 years between c. 1600 BC and 100 AD, is not a single text, but a compilation of spells thought to equip the dead with knowledge and power which would guide them safely through the dangers of the hereafter and ultimately ensure eternal life. 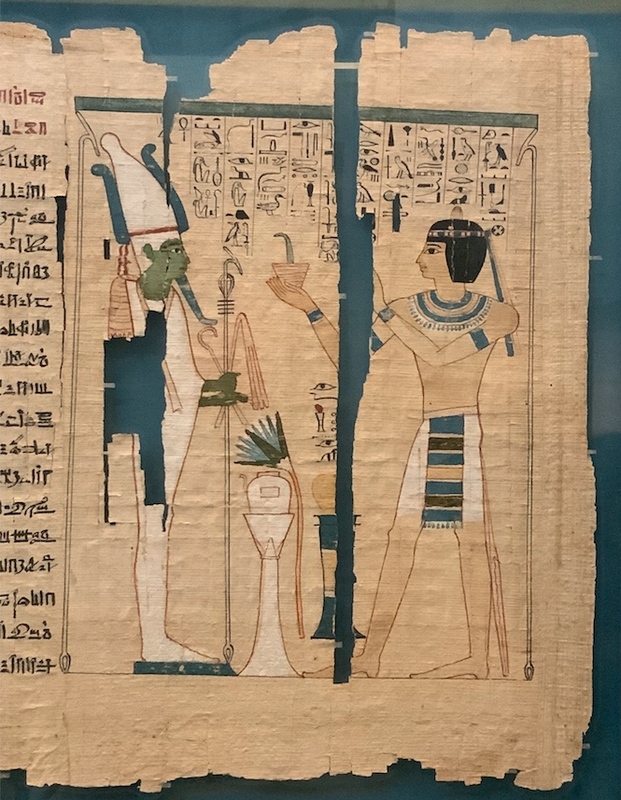 In scene after scene we see Osiris, the god of resurrection, wearing the bright white garment of immortality the famed British Egyptologist, and poet, Gerald Massey, called the Karast. 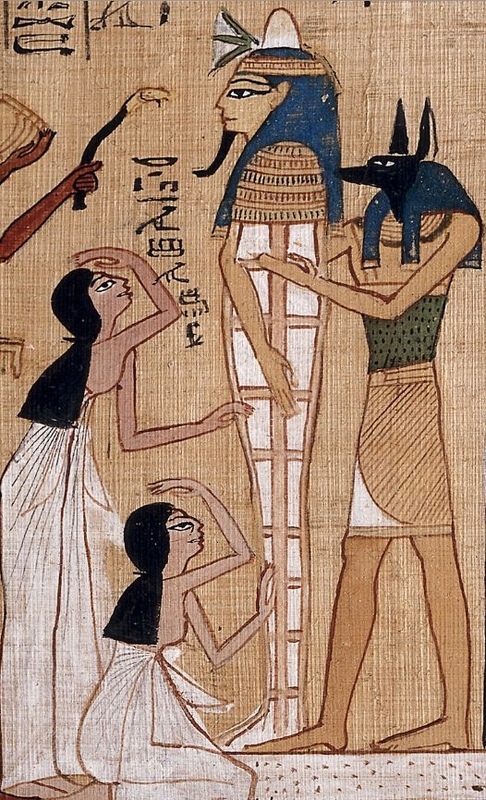 The resurrection of the human soul in the after-life, said Massey, was the central fact of the Egyptian religion, and the transfigured, re-erected mummy, otherwise called the Karast, was the supreme symbol. This garment was “put on” metaphorically during an anointing ceremony. This became the “coat without seam woven from the top throughout” of Christ (John 19:23). In the Papyrus of Ani we note something very important. Look at the priestesses who are in the presence of the Karast. They are clad in transparent garments which are symbolic of the light body. More, they are touching the Karast and then transmitting its essence to their head. This is the Egyptian version of the Sumerian Melammu principle. Here, Osiris wears the Karast while standing before the blue lotus. The stick he holds is what I term the Resurrection Stick. A combination of the uas, ankh and djed pillar, it opens the gates of the Dimension of the Blessed. Another spectacular representation of the robe of light is found on the sarcophagus lid of the ‘God’s Wife’ Ankhneseferibra from c. 550 B.C. She wears the robe of light and holds the crook and flail, signs of power that were normally reserved for kings. She was the last in a line of princesses whom the pharaohs installed in Thebes to curb the power of its priests. She is elegant, royal, divine. 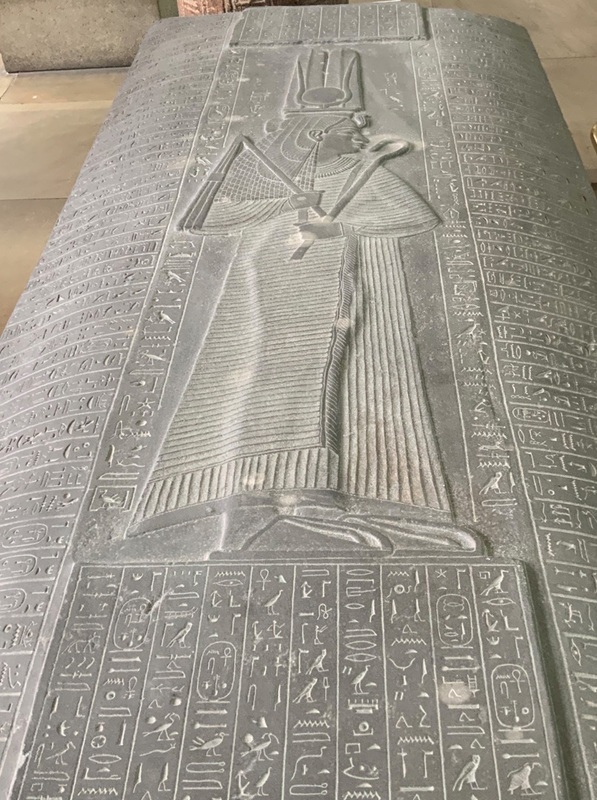 The inscriptions on her sarcophagus are are mix of excerpts from the Pyramid Texts, the Book of the Dead and other religious texts to help her attain the afterlife. She is most certainly dressed appropriately for the journey. A short walk from this sarcophagus takes one to the Greek section of the Biritsh Museum. In c. 447 B.C. the Parthenon was built in Greece as the home for Athena, the goddess of war and wisdom. In 1801 the key marble friezes from this magnificent temple were taken or repatriated to London by Lord Elgin. The British government purchased them in 1816 and they have been in the British Museum ever since. Widely known as one of the greatest plundered artifacts in history, the story the ‘Elgin Marbles’ or Parthenon Marbles reveals the Melammu made its way to Greece. Every four years the Athenians held the Great Panathenaic Festival during which the sacred robe (Peplos) of Athena was renewed. The robe was taken by a procession and dedicated to a statue of Athena on the Acropolis. 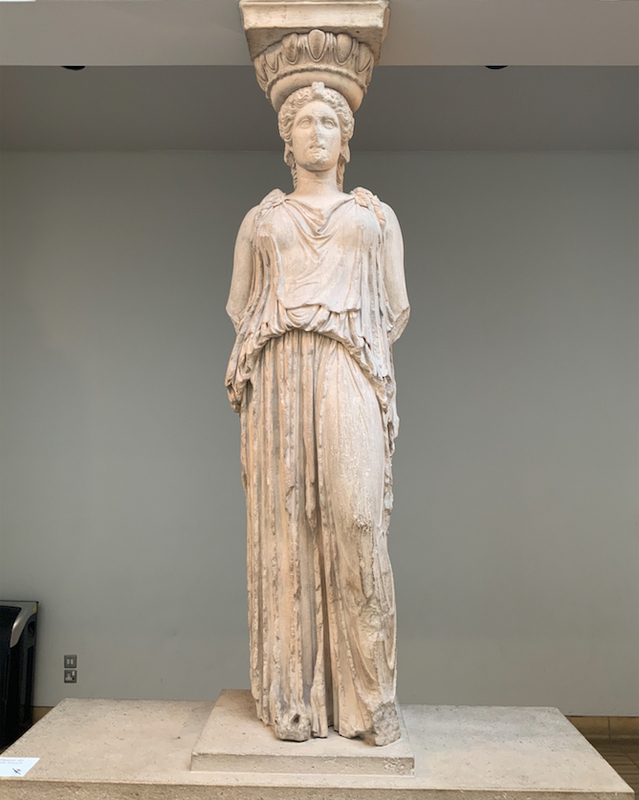 The holiest of all the images of Athena was Athena Polias’ wooden statue on the Acropolis, according to Pausanias (1.26,6), who also tells that rumor says it fell from heaven. This highly revered statue of olive wood formed the center of devotion on the citadel. 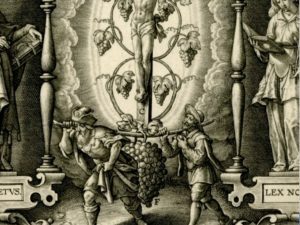 The tradition of its heavenly origin may suggest that no maker for the image was known, and it certainly added to the cult’s venerability. The purple and saffron-yellow robe was woven with scenes of a mythical battle between the gods and giants. The victory over the Giants was one of the motivations for the Panathenaic Festival. The giants are the Nephilim of the Old Testament. They are referred to as the Mighty Ones of Renown due to their possession of a cloak or garment that gave them mighty powers. This cloak is, of course, the Melammu. 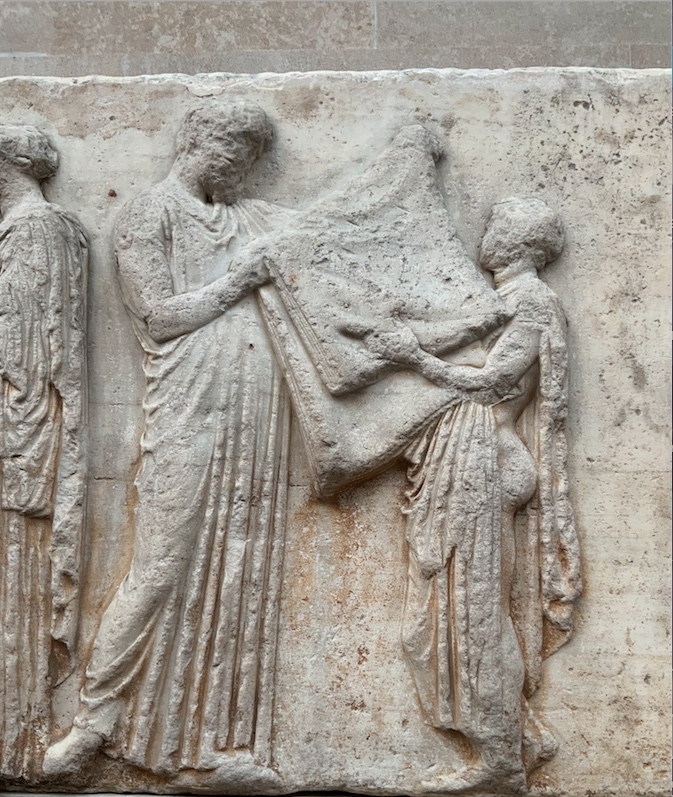 The female weavers in the procession of the east frieze of the Parthenon. 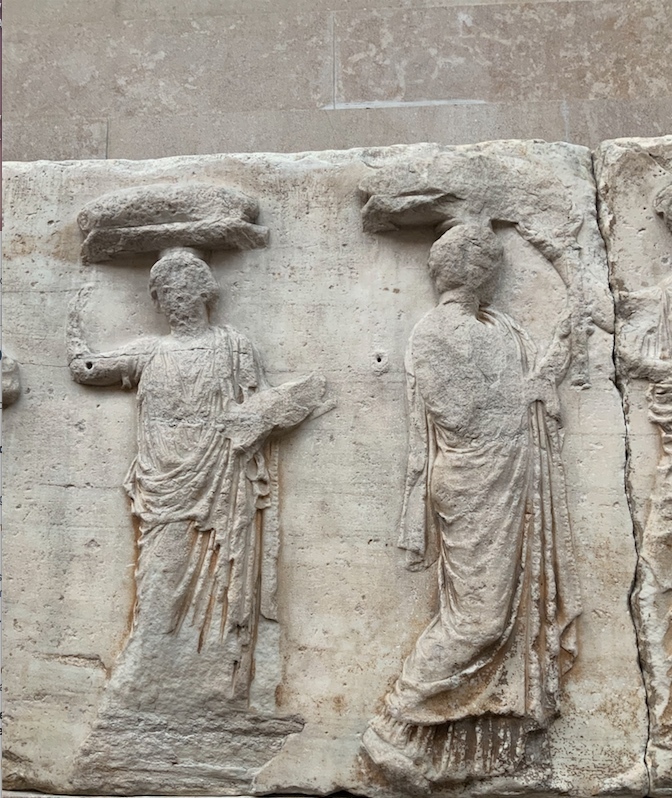 When the procession came up to the Acropolis, it culminated by presenting the peplos,the rectangular cloth, which is illustrated on the frieze, to the life-sized cult statue. The goddess was dressed in her new peplos. In the story of Pandora, the first human, who was made from clay, Athena is the goddess who teaches her womanly skills: “needlework and the weaving of the varied web” (Hes. Op. 60-4). Athena also provides Pandora, with suitable clothing: “And the goddess bright-eyed Athena girdled and clothed her with silvery raiment, and down from her head she spread with her hands a broidered veil, a wonder to see”. The Acropolis was home to the Erechtheum. On its porch stood six Caryatids (maidens) that supported the roof of its south porch. The figure shown here stood in a row of four before being removed in 1816 by Lord Elgin and brought to the British Museum with the other Parthenon marbles. She wears a peplos with a short cloak hanging from the shoulders. 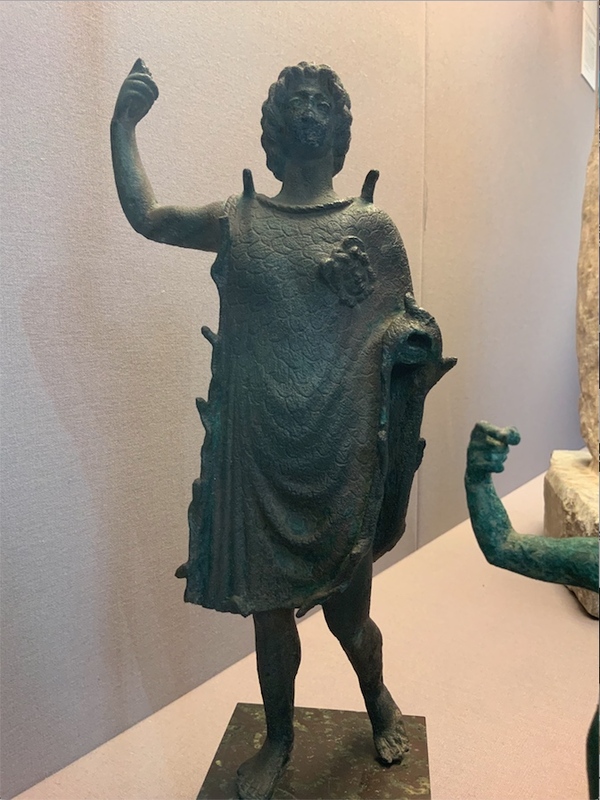 This bronze statuette of Alexander the Great probably came from Alexandria, the ascension center founded in his name in 331 B.C. Alexander wears the aegis or snake fringed cloak cut in the shape of a “chlamys”, a type of cloak worn by his Macedonian soldiers. He likely held a spear in his right hand and a statuette of Athena (palladion) in the left. The aegis associates him with divine power and links Alexander to Zeus and Athena, who both worth this power cloak, but also to Alexandria, which ancient authors said was laid out in the shape of a chlamys, pointing to the importance of this garment. The statue was made in Egypt, around 200 years after Alexander’s death, and it demonstrates well the importance that his successors attached to the great man’s image. Zeus had appeared to Alexander as Zeus Ammon in the Egyptian oasis of Siwa in 331 BC, and had announced Alexander was his son. So, of course, Alexander should wear the garment of the gods. In late 332 BC Alexander succeeded as Pharaoh of Egypt. Before leaving the country to continue his conquests in the East, he founded a new city on the Mediterranean coastline and named it after himself. Within eight years he was dead, but Alexandria was to become Egypt’s capital and remain so for over 1,000 years. This small statue was inspired by a large cult image from the city where, as founder, the deified Alexander was especially revered. By wearing the aegis Alexander is being presented as an equivalent of, if not an equal to Athena. He is to Alexandria what Athena is to Athens: a divine patron and a protector. The aegis, therefore, defines Alexander as an invincible fighter, like Athena who wore the garment in an epic battle between the gods and the giants. This close association with Alexander suggests that the goddess has extended her divine protection from Athens to Alexandria, a new center of culture and an ascension mystery school. 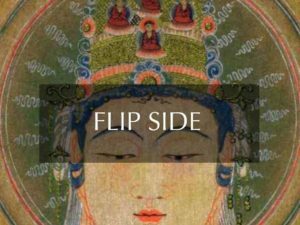 The British Museum’s Asian Wing is home to a beutifully presented collection of devotional images from India, Afghanistan, Pakistan, and other parts of the world where Buddhism flourished. In 330 B.C., Alexander the Great conquered this region and, together with the Indo-Greek kings that succeeded him, introduced classical art traditions that became an important part of Gandhara’s artistic vocabulary over the next seven centuries. In early Buddhism there was no image of the Buddha to which worship was offered by any Buddhist. Buddha did not believe in icon or image worship. Therefore, he was not presented in human form. His presence was marked by symbols — the boddhi tree, the wheel of the law, footprints, and an empty throne. This changed in the 2nd century, concurrent with the advent of Christianity and its use of icons of Christ, and images of Buddha began to appear. From the 3rd century onwards images and icons of the Buddha and Bodhisattvas (Buddhas before they reach enlightenment) came into vogue in monasteries in India and elsewhere. Monks had in their cells, in a window or niche, an image of the Buddha which they treated as ‘living’ and were venerated (loved) accordingly. Each morning they bathed it and offered flowers and incense to the icon. At midday they offered part of their meal to it. This is because these statues were ‘alive’. 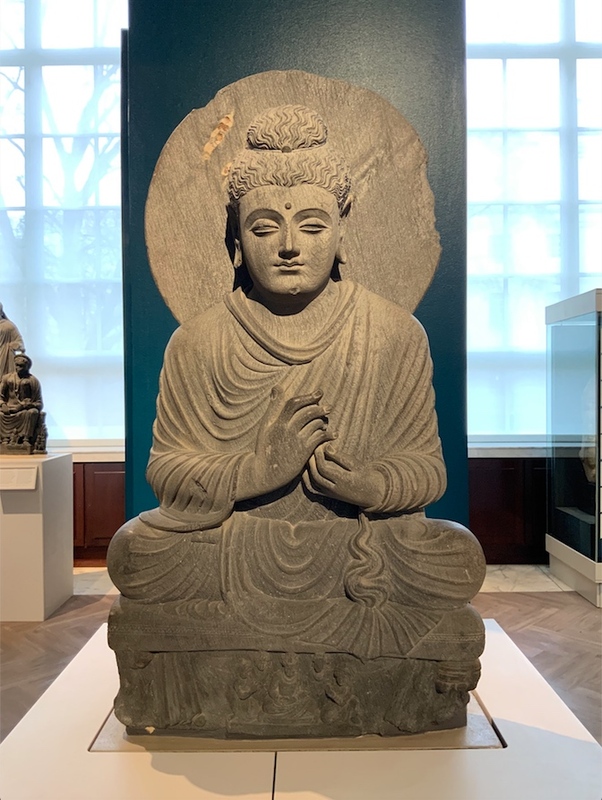 This rare portable image shows Buddha from Gandhara (northwest Pakistan) wearing a full body garment that is radiating light. Traces of gold in his robe on other statues like this and the serrated radiating halo of light rays indicate that originally this figure would have had quite a different appearance, one that would have equated his enlightenment with light streaming out from these reflective gold surfaces. Instead of fringe or feathers, as in the Sumerian and Egyptian examples, Buddha’s cloak is enclosed by a border of pearls arranged in the triple dot pattern of the chintamani, the wish-fulfilling gem that produces the light body. The message here is that Buddha is supreme being with the super powers of a deity. 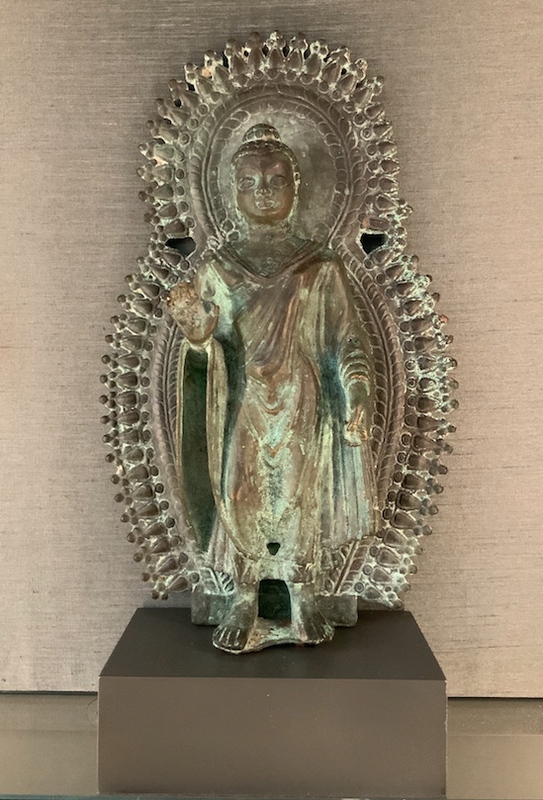 The portability of this statue made it an ideal teaching tool for disseminating accounts the Buddha’s miraculous life and light body teaching. Most importantly to our discussion, it emphasized his physical presence, through the statue, at the site. 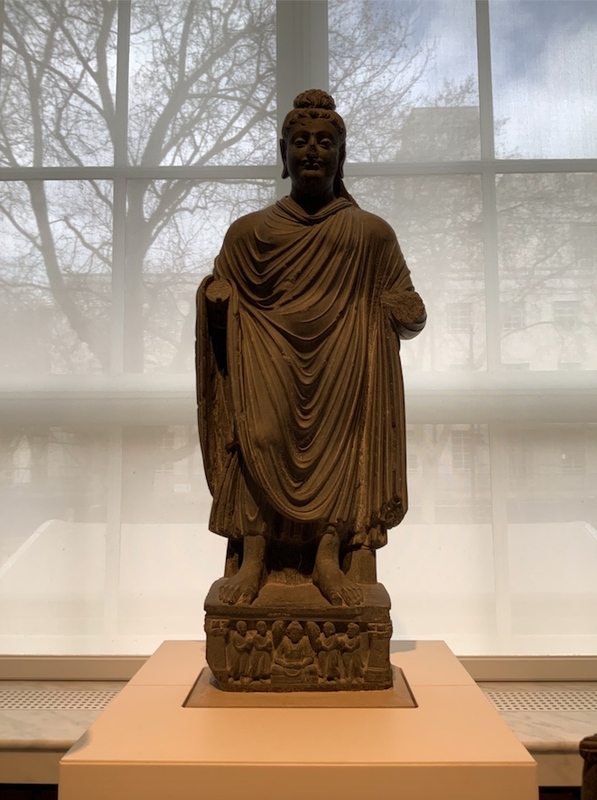 In later images, the subtle contours of the Buddha’s enlighted body are stressed rather than emphasis on his radiant robe, as in this example in the Asian Wing. 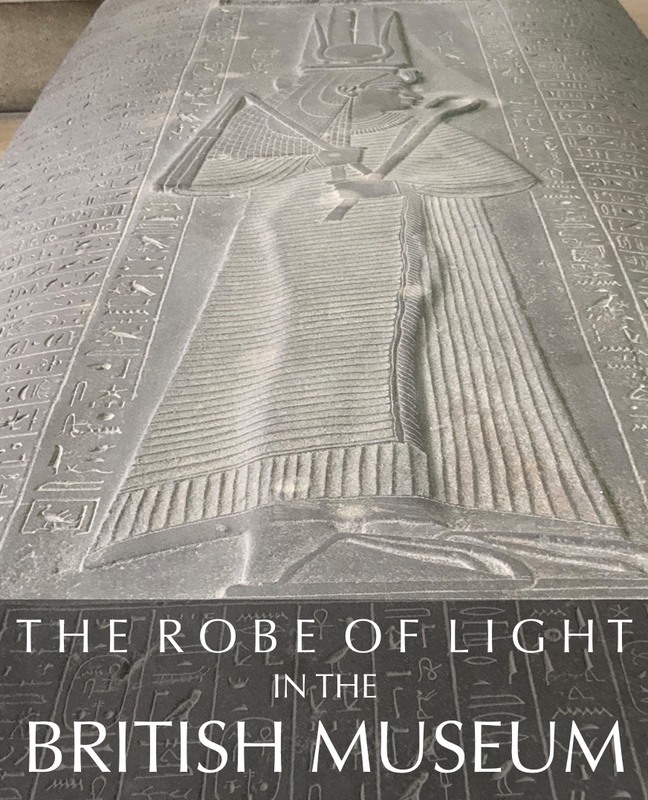 The British Museum is home to many more fantastic images of the robe of light than I can discuss here. 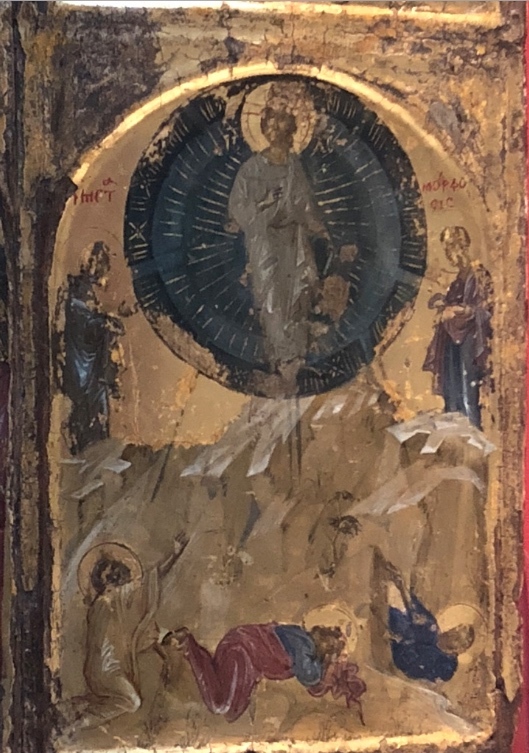 So, I will leave you with one final image…a beaming 13th century icon of the Transfiguration of Jesus in which he momentarily shines like the sun and his garment became white as light as described in Matthew 17:2. It is a clear reference to the Melammu in early Christian teaching. These few examples go a long way toward showing the amazing similarities in light body art from ancient Sumeria, Egypt and India. The connections are interesting and fascinating, but also enormously and profoundly inspiring. Is it possible, as the ancients believed, that we can put ourselves face to face with an image of a divine being and receive a transmisison of their presence or the vibration of their power cloak? Indeed it is. This will keep me visiting the British Museum again and again. 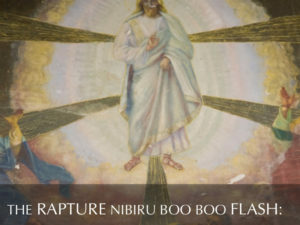 THE RAPTURE NIBIRU BOOBOO FLASH : FAKE NEWS? OR GOLDEN THREADS WE CAN USE? William, I saw this Egyptian wall painting in the news today and was wondering what it is about?